Today's card is for this month's challenge for the blog group that I belong to. The challenge is a color challenge and we were to create a card using the colors red and black and we were not to do any coloring on our cards. Well, I have to say that this really was a challenge for me! I find myself coloring on almost all of my cards, but this challenge made me think. ***I'm editing to add that the challenge blog I made this card for is no longer posted. The blog was removed. 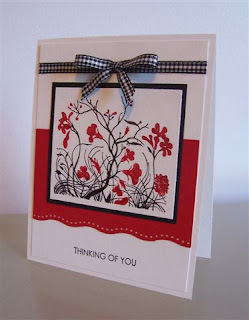 My card also fits Friday's Splitcoast limited supply challenge in which we were to create a card that uses ribbon and a border punch. I used my SU markers to color my image and then I stamped it onto my card stock. I had to go over the stamp a few times using my markers in order to get a nicely colored image. It helps if you stamp your image first and then cut it out. This way you won't have to try and get it centered on your card stock. I added a real red card stock layer behind my image and then I punched it using my EK Success Dotted Wave border punch. My sentiment and image are both from the same stamp set. Thanks so much for looking! Have a wonderful rest of the weekend! Hey Patty - this is beautiful! So pretty. Awesome awesome job Patty. This card is great. Love that stamp. I love the clean and simple look of this card. Very elegant. Lovely layout. Looks very nice.